strikes against terror attacks in Egypt. Egyptian security forces managed successfully in coordination with the national security sector, in seizing smuggled weapons and explosive devices intended for use in terror attacks inside Egypt, and arrested terrorist cells and terrorist elements of the Muslim Brotherhood terrorist organization. On 28/2/2015, security forces arrested Muslim Brotherhood terrorist elements, after failed attempt to assassinate the chief and the Associate of Nasser police investigation center in Beni Suef. Police also seized the machine gun and ammunition used in the assassination attempt. The MB terrorist element admitted in the following video, that him and others targeted the two police officers on their way home. 1. Muhammad Juman Mahmoud Agroudi. 2. Aly Abbas Abd Al-Ayouti. The third suspect managed to escape, taking advantage of the nature of the agricultural region. As the following video shows, Police found the suspects in possession of : 7 explosive devices intended for use – large amounts of chemicals and tools that are used in the installation and manufacture of explosive materials – 2 mobiles connected to wire bombing circuits – 2 Mobil cards- 3 batteries 9 volt – 6 bombers – Molotov bottles. 24 February 2015, El-behera city security forces arrested a Muslim brotherhood terrorist cell in Wadi Elnatron city, involved in executing a numbers of terror attacks in Egypt. The 5 MB terrorist elements in the following video are: Karam Mahmoud Abd Elghfar, 35 years old, electricity and maintenance technician – Ahmed Saiid Gabr, 29 years old, a labor in a telecom central – Ahmed Essmat Algazar, 27 years old, sales representative – Bilal Mohamed Abd Elghany, 35 years old, driver – Gamal Saber Ahmed, 45 years old, teacher. Machine gun caliber 7,62 × 39, rifles, and (4) shots of the same caliber, a laptop, and the central processing unit CPU – Weapons caliber 12, and two shotguns of the same caliber – A laptop – Russian weapons caliber 7.62 × 39 and (2) shotguns of the same caliber – 4 prepared bombs for processing an explosive connected with electronic chips – High explosives -Gunpowder. Military uniforms (2 jacket and trousers) – Muslim Brotherhood books of Islamic Jihad which contain MB ideas of Jihad and sharia laws- Instructions and notes related to the tasks of the terrorist cell – A set of memos on Islamic Jihad against the Egyptian state and civilians, instructing on using Hostilities, sabotage and assassinations against civilians, police and military forces – Leaflets contain killing threats against the civilians who refuse the Muslim Brotherhood rule and those who support the state and the current leadership. 24 February 2015, Alexandria security Directorate. Security forces in Alexandria arrested a Muslim Brotherhood terrorist cell formed of 12 elements. The following video, the MB terrorist elements admitted that their tasks were mainly to target the vital buildings and institutions of the Egyptian state and assassinations of Police and armed forces individuals. The Muslim Brotherhood cell arrested by the police security forces in coordination with the national security sector and the general security body. 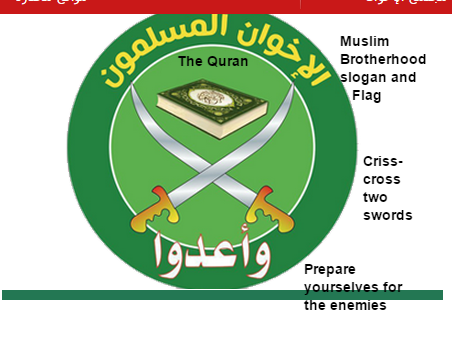 Muslim Brotherhood terrorists cell of 12 elements are: 1. Essam Mohamed Mahmoud Aql, 33 years old, unemployed – 2. Alsayed Gab Alsayed Gaber, 25 years old, unemployed – 3. Mohammed Abdullah Mohammed Abdel-Fattah, 26 years old, unemployed – 4. Mohamed Mohamed Ibrahim Awad, 21 years old, air conditioning technician – 5. Ahmed Hassan Ibrahim El-Maati, 35 years old, an electrical engineer – 6. Mahmoud Alsayed Mohamed Aly Baatar, 35 years old, Production technician in pharmaceutical company – 7. Osama Abdel-Hamid Abu Alazm, 41 years old, accountant – 8. Ayman Mahmoud Abdel Fattah Sayed Nasr, 34 years old the storekeeper – 9. Ashraf Mohammed Abdasameea Karana, 50 years old, electrical engineer – 10. Abdulwahab Abdulsalam Othman Abdul Salam – 34 years old, owner of sewing workshop – 11. Mohammed Alsayed Abdel Azim Qasim, 32 years old, unemployed – 12. Mohammed Atef Mohamed Tohamy – 20 years old, painter. Police seized the following: 61 empty iron explosives with cylindrical form, 10 ferrous metal, welding machine, machine for sharpen metals, 3 scales, two cans contain unknown liquid material, amount of different shapes and sizes of iron pieces, 10 bags contain materials of different colors and chemical powder, electrical circuits, 7 Mobile Phones, 2 tablet devices, pc flash memory, 13 Masks, 19 batteries, papers in handwriting on how to prepare electrical circuits – 4 phone lines, 3 Timer, 7 lamps, 2 rolls of tin welding, 24 pieces of plastic inside them 8 batteries, a big quantity of electrical resistors and capacitors, papers contain information about the satellites frequencies of Muslim Brotherhood media channels broadcast from Turkey and Qatar, 2 private cars, leaflets contain inciting against the Egyptian state. My name is Alsayed Gab Alsayed Gaber, I have joined the Muslim Brotherhood from 2008 or 2009. The Muslim Brotherhood Walid Fahmy, told me to work in one of the security committee of Muslim Brotherhood. I worked for the MB security committee for about 18 month till I got arrested. This security committee’s work was formed of many tasks. One task was to deal with civilians who support the current leadership of Egypt. Meaning that we were instructed by the MB security committee to target any civilian in Egypt who is against the Muslim Brotherhood, by terrorizing them, targeting them and causing damages and burn their homes, their properties and target also where they work. Other tasks that were handled to us by the MB security committee and we executed these tasks, cutting the international road many times, burning and bombing private and public properties. I handled one of these operations and my task was to plant two bombs and explosives in one of the cafeterias like “Sikabella cafe”, my group and I bombed this cafe. We also had a task to plant two bombs at Al-Atareen police station and in the area of Al-Anbary family. My name is Essam Mohamed Mahmoud Aql, I know the Muslim Brotherhood since I was a kid. After the revolution and the disengagement of MB Rabaa square sit-in, I joined the Muslim Brotherhood groups for the purpose of securing their demonstrations. Then I joined another MB group who were specialized in preparing and setting explosive devices and bombs. I had a specific role in this group, to manufacture the metal part of the device with special measurements in order to penetrate the iron by about 5 cm and to penetrate the concrete by 25 cm. I worked with two Muslim Brotherhood groups, one group was manufacturing the chemical materials and we were doing the finishing, and another group was handling the electric circuits. My name is Ahmed Hassan Ibrahim El-Maati, I’m a Muslim Brotherhood member for almost 4 years now. Recently, I was recruited by Muslim Brotherhood Mr. Ossama Abd El-Megid, to join a Muslim Brotherhood group, which their main task was to shut down electricity by damaging the electrical cables and sabotaging electricity stations, to ruin the water machines, to cut the main roads. We executed many operations in this regard. My name is Mohammed Abdullah Mohammed Abdel-Fattah, I have joined Muslim Brotherhood since 2007. I started to join their demonstrations from 13/8/2014 and also during the Rabaa square MB sit-in, 2013. The person who recruited me is the responsible for our MB group, his name is Saiid Elfeky. My group and I received instructions to burn electricity cables and destroy the land lines wires and cables. We were instructed also to ruin the water machines. We burned two electrical cables near Setia company and another one in Kabu area. We also ruined the land lines in Almahmoudeya area. Then we received instructions from another Muslim Brotherhood supervisor, to execute 3 different operations: 1st, to burn a tramway, 2nd to burn a public bus, 3rd to cut a main road. 23 February 2015, the security forces arrested 9 Muslim Brotherhood terrorist elements committed terror attacks and assassinations in different cities in Egypt: Sohag, Dakahlia, Cairo, Fayum and Munufyia. The following video, shows the Muslim Brotherhood terrorist “Ahmed Maher Elhendawy” who assassinated the son of Judge Mahmoud Al-Sayed inside his house garage. Also the arrest of 3 Muslim Brotherhood elements who burned a telecom central in Ain Shams area on 25/1/2015. In addition to the arrest of other Muslim Brotherhood elements who burned a train station in Maragah sohag city, after planting explosive devices on the railways and inside the station. They were arrested before planting bombs in one of the courts in the same city. The arrest of MB terrorist Rabii Ibrahim, wanted for justice, he received 10 judicial verdicts in different cases, for committing terror attacks and terrorizing civilians. Arrested in Fayum city and admitted burning the police center of the Noras court and smuggling chemical materials and weapons to use in terror attacks. The arrest of 2 Muslim Brotherhood elements for burning the train of Itay Albaroud, Alkhatatba area in munufiya city and shooting randomly at civilians, in addition to burning private properties. 19 February 2015, security forces arrested different Muslim Brotherhood terrorist cells in Cairo, Behera, Suez and Fayum cities, committed terror attacks in targeting churches, vital buildings, private and public properties, civilians and security forces in Egypt and inciting on violence and chaos through the social media. In Behera and Suez city, the arrest of 12 Muslim Brotherhood terrorist elements, admitted that they were trained to bomb electricity stations, police and army vehicles, burning churches and terrorizing Christians, spreading chaos and terrorizing civilians. 18 February 2015, Damietta city. The arrest of 5 MB terrorist elements in possession of: weapons, Molotov bottles, ammunition, explosive devices, 23 pieces contain bolts, masks and some pamphlets contain instructions from Muslim Brotherhood leaders outside the country, about targeting police and army buildings and individuals. Terrorists elements were arrested before planting explosive devices in one of the security vital buildings and electricity stations in Damietta city. The following video starts from the start to 1:47 minutes. 17 February 2015, the arrest of 6 elements of MB terrorist cell who burned Abu Dhabi bank entrance and Mobinil telecom company in Al-Ahram street Cairo, in addition of using Molotov burning bottles, firearms, weapons to terrorize civilians in the street. They admitted forming a terrorist cell with others and their responsibility for burning the KFC branch in Alebiny road in Haram area, Giza. The following video shows the 6 MB elements while burning the bank and the company and they gave full details about the instructions they received to burn the bank and the company and the role of each of them in all terror attacks, they have committed in damaging and burning private properties. The video also shows the arrest of 3 MB terrorists responsible for burning Mobinil telecom branch in Faisal street. They admitted that they were instructed to execute different tasks in targeting private and public properties mainly in Al-Haram and Faisal street in Giza area, Cairo city. One of the elements got serious burns in his face and hands while burning the Mobinil company. 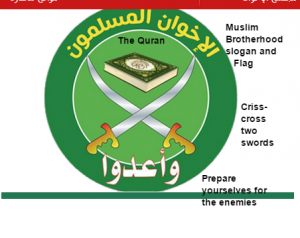 In addition to the arrest of 8 Muslim Brotherhood elements in possession of explosive devices and other materials for the purpose of making bombs and explosives. They admitted their responsibility for many terror attacks in planting bombs in public and private buses, buses stations and banks in Cairo. 8 February 2015, the arrest of 4 Muslim Brotherhood terrorist cells formed of 35 elements, committed terror attacks in 4 different cities in Egypt (Alexandria, Giza, Dakahlia and Fayum). They targeted public and private properties, police and military forces and terrorizing civilians. Details As the following video shows, in Alexandria city, the arrest of 19 terrorist elements formed a terrorist cell under the name of “Thunder group“. Caught in possession of explosive devices, bombs and weapons. They are responsible for committing 43 terror attacks, in planting bombs and explosive devices in private and public properties. One of the MB elements in the video admitted that he was the leader of the group and he received the instructions of these tasks from Muslim Brotherhood Engineer Ahmed Bakry who works in one of the Alexandria administration bureaus in the Alexandria governorate. He admitted also his responsibility of recruiting youth from Muslim Brotherhood in Alexandria, in addition to his responsibility in managing and organizing Muslim Brotherhood demonstrations for the purpose of causing as much chaos as possible in targeting public and private properties during their marches. The target of causing chaos as he and others admitted, was to spread terror and to confuse the regime in Egypt and to force Egyptians to lose their trust in the institutions of the state, till they topple the current regime and release Muslim Brotherhood leaders from jails and get them back to rule the country again. The arrest of 3 MB elements in Giza city, formed a terrorist cell and they were caught in possession of explosive devices, big amounts of Nitrates for the use of manufacturing explosive devices, different sizes of electric wires, cables, electric circuits, mobiles set to an electronic board and explosive grids. In addition to the possession of Isis slogans and flags. They admitted planting many explosive devises and bombs in targeting public and vital buildings. One of the MB terrorists admitted in the video, that they declared loyalty to ISIS because they are Jihadists and their purpose was to do the same in Egypt, as ISIS is doing in other Arab countries. The arrest of 3 MB terrorist elements in Fayum city, arrested after they opened fire on Etssa police station on 27/1/2015 and killed police corporal Eid Attia Ibrahim and injured police soldier Emad Eid. They admitted in the video, taking money as a reward for attacking the police station and killing the police individual. 5 February 2015, The ministry of interior arrested 25 MB terrorist elements committed terror attacks in 3 cities, Port Said, Suez and Giza. The following video shows the arrest of 5 MB terrorist cells in Port Said formed of 15 terrorists, committed burning and bombing vital buildings, Electricity stations and cables, private and public properties. This cell committed 17 terror attacks in port said city. Police seized explosive devices, machine guns, different type of weapons and ammunition and different tools and equipment in setting explosive devices. In addition to ISIS flags. In Suez city, police arrested a Muslim Brotherhood terrorist element and others, committed terror attacks against police vehicles and the attempt of burning the Saudi consulate in Suez city, and burning private cars of the police officers, in addition to burning public properties. In Cairo, the arrest of a Muslim Brotherhood terrorist element and others burned the post office and the telecom central of Ain Shams. 4 February 2015, the arrest of 2 drug dealers admitted that they were hired by “Sheikh Mohamed” a Muslim brotherhood member (the man on the right side in the following video with the long beard), to join the MB demonstrations and Jihad against the state, in return of paying each 200 pounds daily, instead of selling drugs. 4 February 2015, the arrest of Muslim Brotherhood terrorist elements admitting their attempt of burning Al-Munib Police station, a branch of an Egyptian telecom private company “Mobinil” and KFC in Maryutia area. Source of information and videos: The Egyptian ministry of interior links on Youtube, social media and main site.